With this week's Rewarding Times, and in another exclusive, Stanley's Restaurant and Wine bar are offering a special opportunity to sample an evening of the best produce and wine in the beautiful surroundings of their Georgian building. Spanning over three floors, the ground floor wine bar offers candle lit surroundings with a stunning feature brass bar. The second floor Parisian-chic restaurant features original bay windows along with our third floor private dining space; the Card Room. 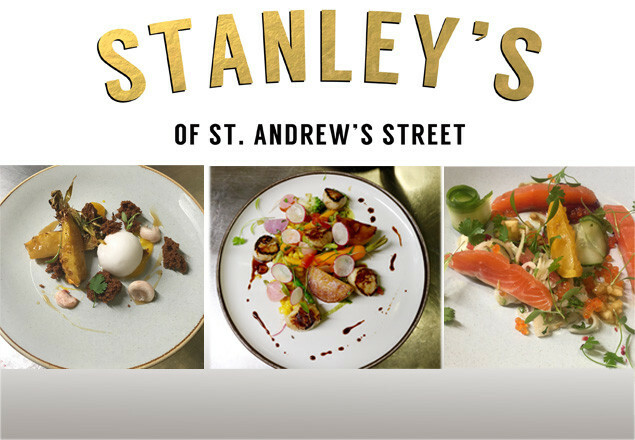 Stanley's is located in the heart of Dublin's creative corner, home to one of the most innovative, inspiring wine lists in the country. Chef Proprietor Stephen McArdle, together with Sommelier Morgan VanderKamer have designed a five course tasting menu sure to delight your palate. Recently awarded the Wine Spectator Award of Excellence , one of only two Dublin restaurants to do so! Stanley's have also been shortlisted and won numerous domestic awards such as the Georgina Campbell Wine Award 2016, the Dublin wine fest; Best wine Experience2015, Food and Wine Magazine Awards- Best Wine Experience & Best Sommelier. Fast becoming the go to place for wine aficionados having hosted many of the world's most iconic and talented wine makers. Each month winemakers visit the wine bar for an informal night of wine tasting and learning. Let the magic of Stanley's of St. Andrew street surprise you with this exciting offer. This offer is only available to 110 couples. Vouchers must be printed and presented in paper form upon arrival at Stanley's Wine Bar and Restaurant on the night. Vouchers are valid from 27th September 2016 until 27th January 2017. Offer not valid for month of December. No correspondence will be entered into regarding late redemption of your Rewarding Times Voucher. Vouchers are valid for dinner bookings on Thursday to Saturday evenings from 5pm. Only one voucher per couple. This offer is not valid in conjunction with any other offer or promotion at Stanley's Wine Bar & Restaurant. Any over spend of this offer will be paid directly to Stanley's Wine Bar & Restaurant on the date of the reservation. Voucher Code must be mentioned upon booking.